The artist retains full copyright on all artwork that is produced, including mock-ups, digital displays, and the ability to produce prints. Original artwork has been resized to better fit standard matte and frame sizes. Please title your inquiries by email as such: Print Request, and know the title of the artwork you are interested in purchasing or simply link to the page in your email. 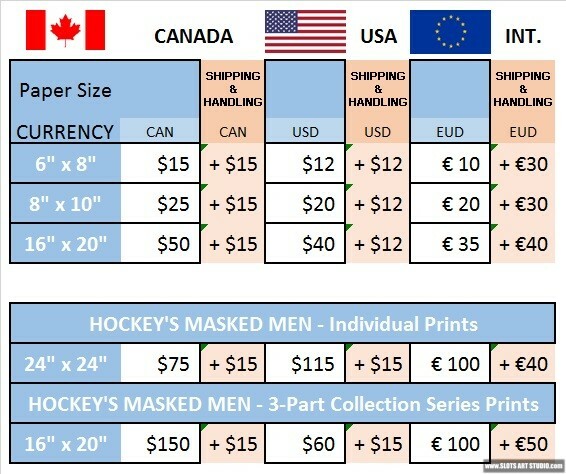 Please note, the Hockey’s Masked Men canvas prints are no longer available. Only the 24″ x 24″ prints will be sold. Prices may vary depending on the series of artwork, size, and medium. Please title your email as such: Purchasing (title of desired artwork) Inquiry. All prices are listed alongside the artwork in its assigned gallery section. Please refer to them there. Interested in custom ordering your own original artwork? Please visit this page here for more information.